LW is a retired 74-year-old woman who lives with her husband in Sunnyside, WA. She was born and raised there and came from an immigrant mother and father who came from Guadalajara, Mexico. She never went to college but became a mother to three children and a grandmother to several grandchildren. She was remarried twice and worked two minimum wage jobs to support her family. Her primary language is Spanish but her English is perfect as well. Are there any holiday traditions or rituals that you have? LW: I used to make this Mexican pudding on Easter called Capirotada. It is similar to bread pudding and it was made with cheese and raisins and my mother taught me how to make it. It was fairly easy to make and it was a fun thing to do for Easter with my kids. When my oldest daughter got, old enough I tried to teach her, but I don’t think she makes it anymore and neither do I. Is there an importance to the dish and why its associated with Easter? LW: It was a reminder of Christ’s suffering on good Friday and the ingredients have something to do with the passion of Christ. I am not sure how but that is what my mother told me when she taught me how to make it. I just know the bread in it symbolizes the body of Christ, as they say in the bible ‘broken and shared so we might live’. Is there a reason this tradition has become more lost to your family? LW: I think it was something we just started to forget about. We used to celebrate Easter every year with family, including my grandkids when they were born. But now we live so far and I have gotten older so I don’t spend Easter with them as a family as much anymore. This dish is common as a Mexican tradition during Easter. As LW explained, it is symbolic of the passion of Christ as the bread of life who suffered to forgive the sins of mankind. The other ingredients stand for the passion as well such as the cinnamon sticks that represent the wood of the cross he died on, the cloves for the nails on the cross, and the cheese for the holy shroud. The dish still continues to be served and has many variations and other recipes as well. PP is a teacher who currently resides in Bothell Washington. She is originally from Yakima, WA but her family descends from Guadalajara in Mexico. Much of her family spoke Spanish as their first language and her grandma was the first to immigrate to America. Much of her influences and culture come from that region and her upbringing in a single-mother low income household. Are there any pieces of folklore or tradition that you felt taught you a lesson you will never forget? PP: Well I feel like every person of Mexican descent has heard of La Llorona, the ghost woman. She was meant to warn kids not to play near rivers or leave home alone at night. What is the story and how is it significant to your history? PP: The story of La Llorona is about a widow who her children are killed by their husband I think? Or maybe the husband dies from being sick and so do the kids, I don’t really remember it as well but, then she kills herself out of grief and is doomed to haunt the river she lived near as a weeping ghost. Many people have had stories of seeing her when next to a river in Mexico, because you can hear her wailing and crying out for her children. I had a cousin who always said he saw her when he was around ten years old. He said he was walking on a road which was next to a river during the day and heard someone yelling and wailing and then saw her ghost. Many other relatives of mine has claimed to have seen her as well so it is common in the culture to actually believe in her ghost. So what is the lesson that you will never forget? PP: The main lesson of it all for me was not to walk outside alone when I was younger or anywhere near a river where I could get hurt or drown I think. It was mostly a warning to all younger kids not to wander off alone or be disobedient because then something bad could happen to you and you would be scared. La Llorona is one of the most universally known ghost stories among Mexican culture. This piece of folklore has been around for a very long time and can vary. Some people say they see her and some people say they just heard her and ran. There is no real documented proof the ghost exists but the legend has existed for so long that many people believe in its truth. Although it is possible this legend was invented to teach kids a lesson it is entirely possible the ghost does exist. Right now, it exists through the belief of the people. Are there any beliefs you had growing up that many people in your culture shared? Any superstitions? PP: Well almost anyone you talk to who is Mexican knows about ‘El Ojo’ or ‘The evil eye’. PP: El ojo translates to the eye but it is a belief that if you stare or look in an envious or spiteful way you can trigger the evil eye on that person. The evil eye can cause bad things to happen like sickness or trouble. Sometimes it is called Mal Ojo because it is evil. This is especially concerning to mothers of young babies because many people will stare at your beautiful child in envy. This is why mothers are more protective of their children. Is there any way to prevent ‘el ojo’? PP: There are healers that would say you can get rid of it with holy water or eggs if someone may have brought the evil eye onto you. It is more of a bad energy and can affect surroundings not just a person. I think that to get rid of it you have to do an entire cleanse spiritually of anything that could have been effected. There are many rituals involving an egg to identify the evil eye’s presence. I don’t think I truly believe in it but there are many people who religiously believe in this superstition and are genuinely afraid of the eye. My grandma and mother were especially afraid of it as I was growing up and warned me never to look at someone in an envious way so I didn’t bring it on someone. I have talked to many people from Spanish backgrounds about ‘el ojo’ and it seems to be one of the most universal superstitions. People do truly believe the eye has powers and an energy that can make terrible things happen to you. The eye is associated with many accidents and illnesses and the ways to get rid of it or detect its presence are very elaborate. You have to get a healer to come and use an egg to detect if the evil eye is present and if it is the yolk will have a shape of the eye in it and then you must cleanse anything the energy could have effected. This could mean, your car, your house, or even your family and friends who could have the evil eye. Although this belief seems to make no sense and most of these things are coincidental, it is interesting how much people truly believe in it and the power of it to affect people’s lives. Do you have any stories about bizarre things your family believed? PP: There are so many weird remedies and superstitions that Mexicans have I don’t even know where to start. One my mother used to do a lot was when I had bad dreams she would put an egg yolk in a glass and keep in under my bed directly where my head was above. That is very odd, what was the purpose for this? PP: She believed it would ward the bad spirits away and protect you and it was like a common day dream catcher. The white part of the egg was meant to catch the spirits and the yolk was there for some other purpose I cannot remember but it was specific too. The glass had to be clear or transparent and had to be placed in the right spot. Also, it had to be removed the next morning after. Do you believe it worked? PP: Not really. Sometimes it may have just been a coincidence that I happened to not have any bad dreams the next night. I think my grandma was very superstitious about it so that’s what made my mom believe it. I don’t practice that anymore because I don’t believe it actually works. I’m not even sure where the belief came from or when it started because it is kind of random and just doesn’t make any sense. I researched this belief and it is commonly found in Mexican culture. The egg was used by healers just like holy water because it had spiritual properties to ward off the evil eye or bad spirits. The evil eye can be brought on by many things such as envy or a stare, but the egg yolk was used to heal people when they were sick or anxious or had any mental or physical illness. The belief is still widely accepted among Mexican tradition today and although it is not widely known among other cultures, it is practiced still. Are there any rituals or things you did on a daily basis that you felt were unique to your family or culture? TM: There wasn’t anything that was very different. There was the bed time prayers we used to say, those were very unique and I never heard them in the bible or any of my friends who were catholic who would say them. My grandmother taught my father how to say them and in turn my father passed it to me as I have passed it to my children. Hopefully they will pass it on. Do you happen to remember the prayer? Do you know what it means or the significance behind it? TM: It is supposed to be a bedtime prayer for children but some adults I knew still said it. It basically means that when you sleep you hope that God will keep you safe and that you will wake up the next morning safe in your bed. I think it became sort of a chore or habit more than a ritual for me. Many times, when I said it I didn’t really mean it and I just wanted to go to sleep. Now that I am older and I have a different relationship with God the words resonate deeper with me which is why I think I wanted my kids to say it too. We all want our kids to sleep safe and this was a way of keeping an ease at mind in a way. I liked to say it with them sometimes when they were really little. I think it loses it significance when you don’t really understand what you are saying especially when you are young. Prayers at bedtime right before you sleep is common between many devout Catholics and Christians. This particular prayer TM shared is common but not widely known or practiced. It would serve as a protection or barrier against harm or bad dreams which is why it was very common among children. When I researched the prayer, there were many variations to the middle phrase of the prayer, ‘keep me safe, through the night’. Sometimes it was ‘may angels watch me through the night’ or ‘guide me safely through the night’. Or I came across one with an alternative ending, ‘god bless family, friends, and fun, I thank you each for every one. Although they vary, they all seem to carry the same message of protection and trust in God. SP is a current student at California Polytechnic University at San Luis Obispo where she studies Geography and Anthropology. She is originally from Seattle, WA and grew up in a small town nearby. She grew up in a typical American middle-class family. She attended a public high school in Washington where she grew up with a sister and her mother and father. She has a background of being half-Mexican and half Irish/Italian that has in some ways heavily influenced her beliefs as well as her religious beliefs rooted in Catholicism. Is there anything else that you have or do that you feel specifically connected to or you resonate with? SP: I wear a ring every day that my mom gave me that is a Irish Claddagh ring that is very sentimental to me and has meaning to me. You wear it to show whether or not your heart is open or closed. The ring has two hands holding a heart with a crown on top of it. The direction you where the ring in tells people whether or not you are single. If you wear it with the crown turned towards you that means your heart is closed because it is not facing out. When the crown faces out it means your heart is closed because the point is towards you. Why do you wear it and what does it mean to you? SP: It is most important to me because when my mom gave it to me she told me that I should hold my heart as a special thing and not give it away so easily and since then I feel like I have always heard her words in my head when I look at my hand and think about it. It also makes me thing she is still with me at the time. I am not very in touch with my Irish heritage but this ring and its tradition makes me feel closer to my religion in ways I can’t express normally. The Claddagh ring has been around for a long time and it makes me feel attached to Irish history. We don’t celebrate much else of that heritage except for the fact that I am a practicing catholic, but even then, this is sentimentally the only Irish thing I know of that I practice. It has become very modernized but I still value it nonetheless. 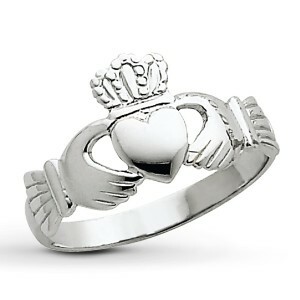 The Irish Claddagh ring has been around since around 300 years ago. It symbolizes love, loyalty and friendship. The hands represent friendship, the heart represents love, and the crown represents loyalty. 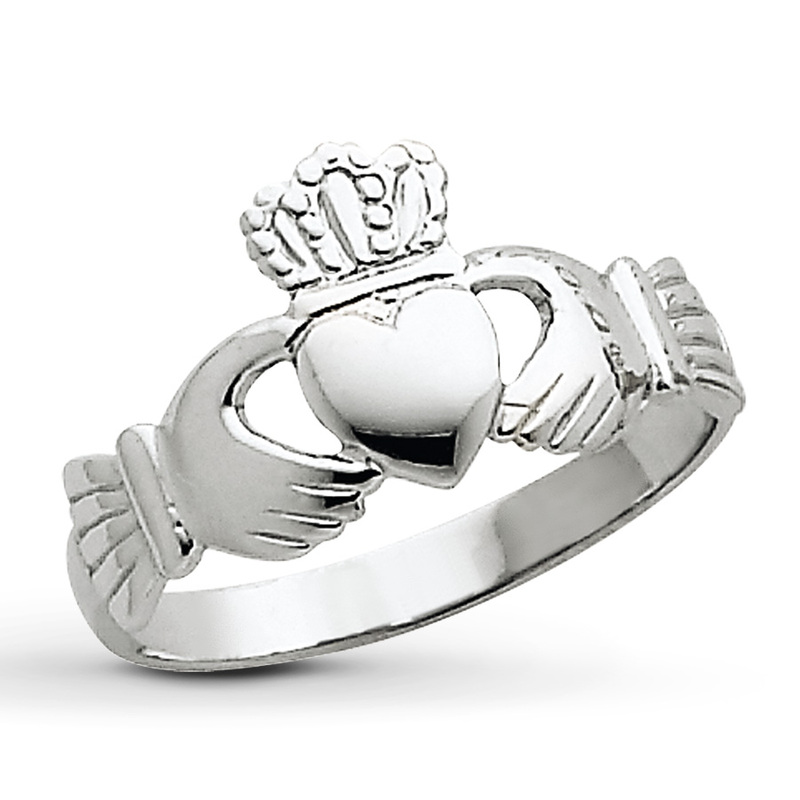 They once originated in a small fishing village in Ireland that created the style of the universal Claddagh today. The design makes it perfect for weddings or gifts for any occasion to women and men who value the three meanings of the ring. It can be a very sentimental symbol to people but also represent the Irish heritage. Many women today I have met wear them but do not know the true meanings behind the ring or where it originated from. I think it makes the value of it stronger to know the meaning and the origins behind it. It can make one resonate more deeply with the heritage or tradition if they know and understand the true meaning or are Irish themselves. Are there any traditions that are new you have come across that you just started to partake in, possibly at college? SP: Well at Cal Poly I have recently started to go to line dancing with my friends. It is on Thursday nights in a small bar with an open dance floor. Around 100-200 people will go a night and it gets really hot and crowded but it is one of the most fun things I have done here. It is something you can go to with your friends even if you are a bad dancer. What is it like? I have never been line-dancing and don’t know what the experience is like. SP: Well line-dancing is a lot of steps and remembering the pattern. They always play the same songs and each song has a dance. 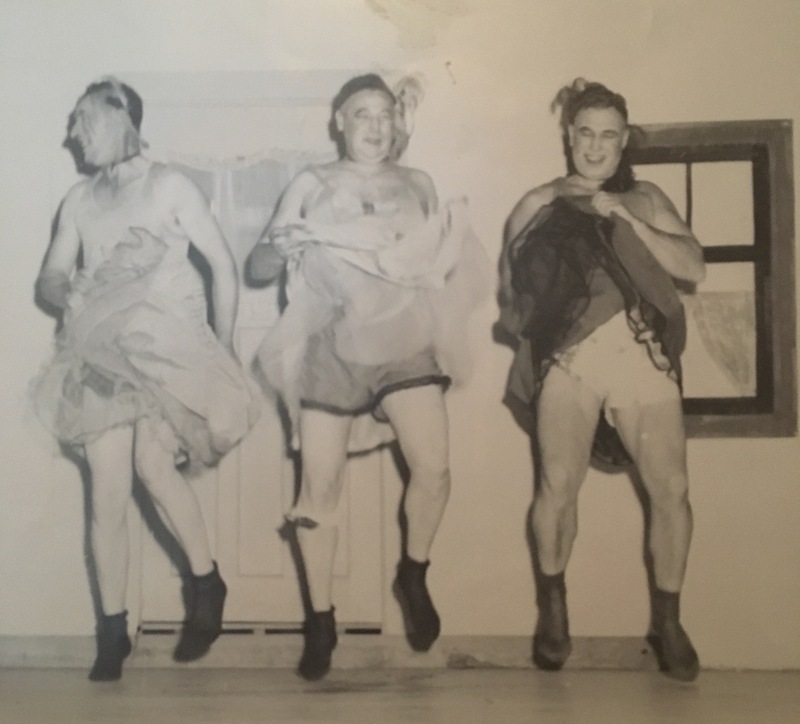 Most of the regulars know all the dances from going so often so if you watch them for a while sometimes you will eventually be able to do it and try it. I am not very good so I can only pick up the slower or easier dances and even then, sometimes I mess up. They aren’t that serious so if you mess up you just laugh it off and keep going but some people are so good and never mess up. I am guessing those people have time to go every week and that’s how they can memorize it and get so good. Why is this so popular or a tradition at Cal Poly? SP: I think it is because a lot of people at Cal Poly like country music and dancing and drinking and at Line-Dancing you can do all of those at the same time with you friends. When I go, I like to go with a group of my friends that I can dance with and have fun with but still make a fool of myself. That’s why so many people at Cal Poly go, because it is fun and easy to go with a bunch of your friends. Line-dancing is popular across the united states but it has died out in places that are not in the south for the most part. IT is making a revival and the small town of San Luis Obispo through college kids because college kids love dancing and most love music that is popular like country. The act of line-dancing is portrayed in many movies and television as people having a ton of fun in pre-choreographed dance that they just happen to be able to learn easily during the night. It doesn’t require as much precision or skill as other kinds of dance which makes it friendly to all people especially young people. It is interesting to see it growing in California, which is not known as a typical southern state. Is there anything you learned from your family that you still actively do today? Like a greeting or gesture that is something you feel is unique to you? SP: Well me and my dad’s side of the family have this secret handshake that my dad made up. At first I think it was just a thing between him, me and my sister but now it has turned in to something all of cousins know how to do. It is really simple it is just some fist bumps and hand grabs and isn’t very hard to remember. It sort has become a family tradition with anyone he is close within the family who is younger. It keeps all of u having something in common that we all know as being the younger generation, we are a bit more separated from the older family in a way. Do you still remember the handshake and use it regularly? SP: Yeah, I still remember it, I have known it for almost 15 years now so it is like engrained in my brain forever at this point. I think it is only really used at family gatherings and we don’t have as many of those because of the fact that all of us have mostly gone to college and all the older aunts and uncles are actually getting to an older age where they come to less events because they have moved away or are spending time with other family. It is rare we get together but when we do my dad always asks us and our cousins in we remember it and we always do. It is nice that he still reminds us all in a way that he hasn’t forgotten us or that fact that we all share this secret technique together. Whenever I see people with handshakes it reminds me of my dad and our family. Handshakes are a dying form of gesture or greeting. It is more common among children in younger ages as a way of bonding or sharing secrets between friends in a school yard setting. IT is now more uncommon since the digital age. People create common emoji messages or snapchats they can send back and forth rather than the significance of handshakes and jumping rope just do not exist after the age of eight or so. Handshakes just do not exist for the most part but used to be a huge form of bonding and communication. I remember when I was younger me and my friends created many handshakes we could share just between one person that made you feel like you had a special connection or unique thing no one else could share. It is sad to see them mostly die out but for those that remain it creates an everlasting bond between you and the other person.